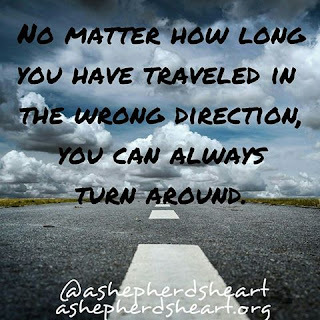 You may have been heading the wrong direction for a while and you know you have. Maybe you're feeling a bit paralyzed or trapped where you are? Let me tell you something you need to hear: It's not too late this side of heaven to make the changes you know you need to make! God is a God of second chances and each day He gives you a chance to begin again! Change the direction of your life now...with God's help and the help of other people He places in your life. It's time for a U-Turn, a Do-over, whatever you want to to call it...it is in order...the time is now! Don't spend another second heading the wrong direction! Get back on the road...the path you know you need to be on...You can do it! Especially with the wisdom and help from the Lord...You've got this! Start heading the right direction right now because you are worth it!! It's time for a U-Turn my friend...what are you waiting for?